A work in progress. Which large format films were shown in Norway in 70mm, Kinopanorama or Cinerama? 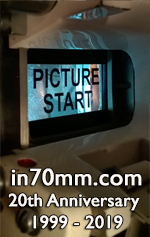 See the list and let in70mm.com know if you can add more details to it. All contributions: titles, dates and adverts are most welcome. Many 70mm prints are archived in cold conditions near the Arctic Circle in the official Norwegian State Film Archive. Full credits for "Svalbard - Arctic Seasons"
Danish advert for the ultra rare 70mm 1-reeler: "Le Corsaire" in Super Technirama 70 from the ballet film "An Evening with the Royal Ballet".